It’s time to take some selfies and post them on Instagram! Choose your girl, pick an outfit and make a nice picture! Complete the hashtags to get even more likes that you can spend on buying new clothes. 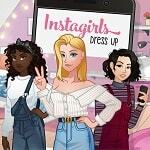 Dress up now in Instagirls Dress up game!